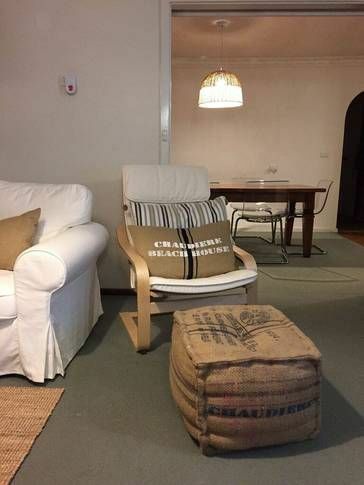 Located in Augusta, just 100 metres from Jay's Beach with great views of the Southern Ocean and the mouth of the Blackwood River. Close to the Margaret River Wine region, and the south west forests. Watch whales and dolphins from the veranda. Surf and child friendly beaches nearby. Leeuwin Lighthouse. Great fishing or boating on the river or ocean. Wineries, caves and all the attractions of Margaret River close by. Chaudiere Beach House is a family holiday home, furnished for casual comfort while still being stylish and attractive. It sits on an elevated bushy block with magnificent views over Flinders Bay and the mouth of the Blackwood River. Its peaceful and tranquil location is only a few minutes walk to the ocean, river, fishing spots and local café. The accommodation consists of an upstairs house and a downstairs flat. The house and flat are completely separate and self-contained, but are never rented separately. Groups of up to eight are accommodated in the house while larger groups are also given access to the flat. There are two driveways (one to the house and one to the flat), which provide plenty of parking and easy access, including for elderly people. However, the external stairs linking the two are quite steep, and care should be taken by groups with young children or frail, elderly people. We cannot accommodate vehicles with excessively high clearances and the driveways are not suitable for anything more than small dinghies. However, there is an area at the bottom of the street where larger vehicles can be parked. The upstairs house has a comfortable living room with a flat screen television and a separate dining room with a reverse cycle air conditioner. There is a well-equipped kitchen with a dishwasher, induction cooktop, electric oven and microwave. Tea towels are supplied. There are four bedrooms that sleep up to 8 people and two bathrooms (including one ensuite). The main bedroom has a queen bed Two of the bedrooms have twin single beds, the fourth (a converted sunroom) has a double bed. The beds will be made prior to your arrival. Each bed has a feather doona and a lighter cover. We also supply one bath towel per person. The downstairs flat has a living/dining room with a television and a kitchen with a electric stove. There are two adjoining bedrooms that can accommodate up to four people. (The main bedroom can be accessed externally through sliding doors, or via the second bedroom). The main bedroom has a queen bed. The second bedroom has one set of bunk beds. The downstairs beds also have feather doonas and light covers and we supply one bath towel per person. There is also a bathroom. The house is inspected and cleaned after each rental. However, its proximity to the ocean and the bushy nature of the yard mean we cannot guarantee sparkling windows and the occasional spider or small lizard may wander into the house. Please be sure not to leave food out as this may attract ants. The security deposit of $200 is held to cover any excess cleaning costs, damage or loss of property. Additional costs will be charged to tenants should this be insufficient. The balance of the deposit will be refunded 5 days after your stay. Check in time is 2pm and you must vacate the house by 10am on the departure date. Rental varies according to the number of all guests. The number of guests, including infants and children, must be provided with your booking request and only these guests can stay in the house. The flat is not rented separately. It is used for groups in excess of 8 people. While it is fine for occasional visitors to drop by for a few hours during the course of your stay, it is not acceptable to use the house for the purposes of holding a party of any description. The right of neighbouring houses to enjoy their peace and privacy is to be respected, and all music is to be turned off or down by 10:00 pm. If reasonable complaints are lodged by outside parties regarding excessive noise or unruly behaviour, your booking will be immediately cancelled and further occupation of the property refused. No portion of unused accommodation fee will be refunded. Our caretaker must be given access to inspect the premise should the need arise. Please do not attempt repairs of any kind. Advise us immediately if there are any problems so that we can take steps to rectify them. Guests must not climb on the roof or engage in any ctivities which may place them or others at risk of injury. Sheets, pillowcases, bath towels, bath mats and tea towels are provided and beds will be made prior to your arrival. The house and flat are inspected and cleaned following each stay. Our rates are calculated on the understanding that guests will leave the house in a clean and tidy state on departure. This includes ensuring that all indoor and outdoor furniture is placed where it was on arrival, all dishes and cooking utensils are washed and put away, any foodstuff has been removed from the refrigerator and cupboards and all rubbish has been placed in firmly tied plastic bags and placed in the outside bin and floors are vacuumed or swept. If the barbeque has been used it should be thoroughly cleaned. Any excess cleaning will be charged at $40 an hour and deducted from your bond. We do not let to groups of unaccompanied minors or to school-leavers. Smoking is not permitted inside the house or the flat. If there are any problems with the standard of cleanliness or anything else on arrival or at any time during your stay, you must inform us immediately. We are always happy to adjust the rent appropriately in the case of genuine problems provided we are informed of these matters in a timely manner so that we can arrange to have them rectified as soon as possible. Refunds will not generally be given if we are not advised of problems until after your stay is completed. Refunds are available if a booking is cancelled more than 30 days before cancellation go a booking. Following that 50% of the rental will be refunded. If the number of guests increases you must let us know at least 5 days before your stay and we will amend your booking. Any reduction in the number of guests will be treated in the same manner as a cancellation. toilet, combination tub/shower, Upstairs bathroom. Separate toilet. Upstairs induction cook top, electric oven, dishwasher. Well equipped. Second kitchen in downstairs flat. Electric stove. Great location over looking the ocean and river. The house was very comfortable and had a fantastic outdoor area. Thanks for you lovely review. We are delighted that you enjoyed your stay and look forward to hosting you again in future. Beautiful views from every angle of this lovely property. Stayed here with family from the UK and had a wonderful few days. House is lovely with everything you need. Will definitely be returning at some time in the near future. We are delighted that you enjoyed your stay and would love to welcome you back at any time. Lovely home with fantastic views. We loved our stay. Accommodation was very comfortable and accommodated our group of 11 very easily. The bbq was not clean on arrival and we reported this to the owner as well as some cobwebs in the downstairs area, but overall the house had everything we needed. Such a nice spot to sit and enjoy the gorgeous beach views. Great kitchen and comfortable beds. Had a great time with all the family. So much space for big groups. Loved it. Glad to hear you enjoyed your stay. Welcome back any time! Great house for the family. Walking distance to beach and a further scenic walk to the shops. Warm, comfortable with a great view. Will visit again. So glad that you enjoyed your stay! We look forward to hosting you again in future. Lovely view, nice and neat and clean. We really enjoyed our stay at Chaudiere House. It's proximity to the beach is perfect and view over the ocean and whale watching experience was a highlight. Plenty of cooking utensils available for so many guests. A few extra towels and blankets would be handy.